Students, faculty, staff and community members had plenty to inspire them during the 11th annual Furman Engaged! Where else can you learn about the human heart, learn how (and why) to blend a smoothie on a bicycle, pop over to New York City, Denmark and Shakespeare’s birthplace, and still have time for Thai noodles? At Furman Engaged!, of course. Furman Engaged! 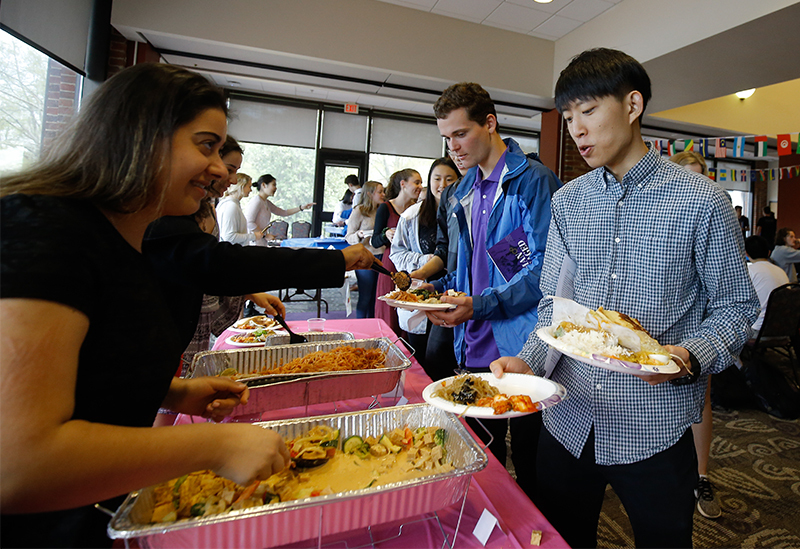 included an international food festival that took place in the Trone Student Center. The daylong event on April 9 celebrated immersive learning experiences available through The Furman Advantage, which provides every student with a personal, integrated four-year pathway that emphasizes mentoring and advising. Students, faculty, staff and community members had plenty to inspire them during the 11th annual Furman Engaged! — from a multicultural lunch buffet to a student gallery walk to internship posters to a panel in which employers revealed what qualities make a strong hire. Here is a look at a few of the presentations from this year’s Furman Engaged! On one of his first weekends abroad in Denmark, Ben Davids ’20 went to a local café at the Fredricksburg Castle, five minutes away from his homestay. That’s when it hit him. Davids realized that the philosopher’s life and work didn’t seem so far away. He was among students in the Rinker Study Away Program who presented their experiences during Furman Engaged! session. It left an effect on her. 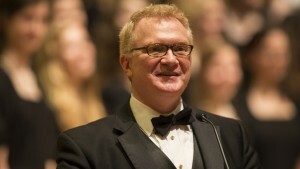 “If I didn’t study away, I wouldn’t be who I am,” said Underwood. Math can take you anywhere. Just ask the four students who presented their summer mathematics research. Emma Kuntz ’21 worked with Mathematics Professor Sarah Bailey Frick to come up with a way to model bacteria growth and antibiotic interaction. 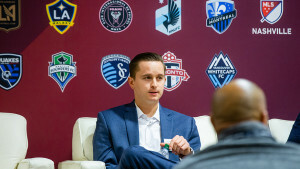 Working with mathematics professors Liz Bouzarth and Kevin Hutson and Business and Accounting Professor Ben Grannan, seniors Andrew Cromer and Jamie Fravel tackled a method to dynamically schedule NFL games to reduce variability related to strength of schedule. Working with the same professors plus Mathematics Professor John Harris, junior Andrew Hartley and his research partner Ella Morton ’20 (on study away) developed a model in their project “Swing Shift,” which helps baseball teams position fielders more strategically to minimize the impact of a batter. “We hope to create an app where you can insert a batter, run it through the program, and determine where fielders should be placed,” said Hartley. 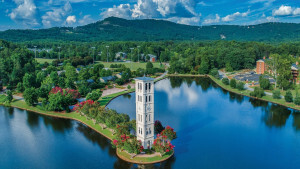 Taking a close look at what’s happening right in Furman’s backyard can be as powerful as any exploration to a remote research site. 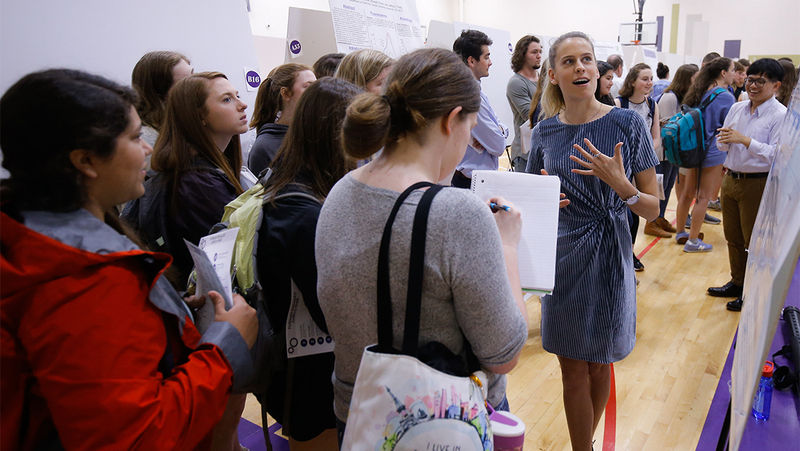 Student poster presentations are an integral part of Furman Engaged! In “An Interdisciplinary Study of Neighborhood Change and Gentrification in Greenville: A Collaboration with the United Way of Greenville County,” students, faculty, post-baccalaureates, and representatives from United Way of Greenville County worked together to increase opportunities for low-income residents. “I’m a huge believer in the idea that you have to be in – and with – a community, so I love the balance of this work of quantitative and qualitative, of understanding what’s happening on the ground in our community,” said President and CEO of United Way of Greenville County Meghan Barp. Imagine getting language tips from a 3-year-old. Laura Metzger ’19 actually did and welcomed the help. During her study away in Madrid, she worked with children as young as pre-kindergarten and as old as sixth grade. She joked that the 3-year-olds kept her Spanish-language pronunciation in check and helped her brush up on commands. Overall, she valued the confidence she gained in communicating in Spanish and the ability to think on her feet in another language. Metzger was among the students who participated in the inaugural Madrid Internship program, which sent eight students to Spain’s capital city and surrounding towns. Furman Engaged! featured interns Katherine Kristinik ’20, who worked with a range of ages as a language assistant, Emma Bondy ’20, who worked in a lab where she studied the role of the brain’s basal ganglia in Parkinson’s Disease and addiction, and other students, who worked in hospital settings, where learning medical terminology was the greatest challenge. The question was more than a hypothetical one to Villagran and her classmates. She shared her experience as a member of Furman’s Art Club, as did other students involved in the group, in an informational video created by Furman students from an introductory communication studies course. 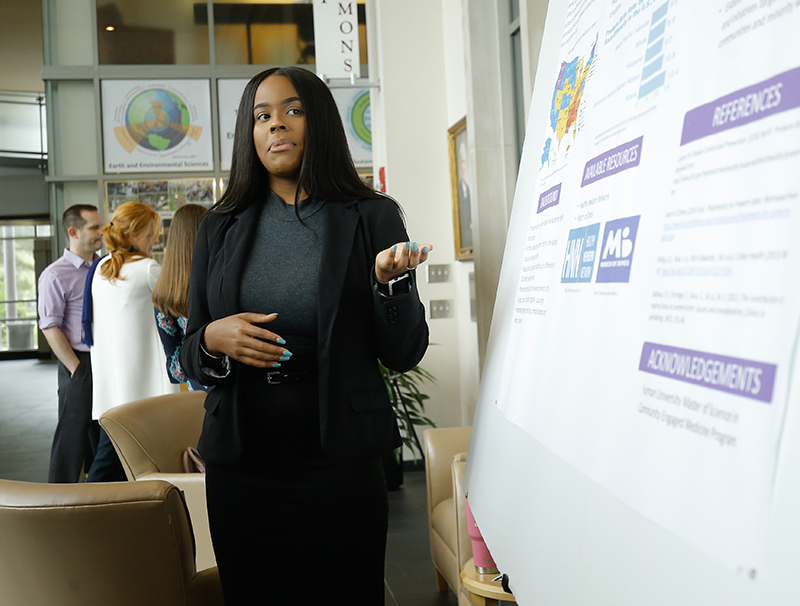 Other communication studies peers shared their own creative, wide-ranging projects. They did so during a session that featured video projects from Furman students in both introductory courses and broadcast courses. Another project was “The Knightly News,” which gave students practical exposure to broadcast journalism, both in front of the camera and behind it, producing a segment about topics such as Women’s Empowerment Month, IT phishing scams and sustainability at Furman. In another presentation, “Early Radio in South Carolina,” Rachel Stanley ’20 spoke about how The Furman Advantage allowed her to do research with Communication Studies Professor John Armstrong and explore The Library of Congress and the National Archives. Small changes in food production, consumption and disposal can make a profound difference to the environment. 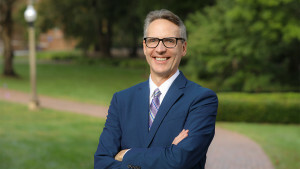 A presentation about Furman’s food system highlighted the university’s many approaches to reducing the university’s carbon footprint. Elise Dudley ’21 spoke about her experience organizing Weigh Your Waste Days to study the amount of food a diner leaves behind in the Dining Hall and her work as a sustainable food service fellow for Bon Appetit Management Company. At Furman Farm, Sophie Kline Schaffer ’21 walked guests around the compost operation and explained its importance. On a global scale, composting directly reduces carbon dioxide and other harmful greenhouse gases and helps Furman Farm reintroduce vital nutrients plants need back into the soil. Rebecca Hearn ’23, assistant manager at the Furman Farm, walked guests through the rows of the farm and pointed out kale, spinach herbs, which, along with the rest of the farm’s harvest, makes up 5 percent of the vegetables served at Furman Dining Hall. Tina Underwood, Carol Anne Ward, Pieper Meredith and Emily Stokes contributed.